Here is a holiday themed card Addicted to Stamps holiday Challenge! I'm sure some people don't want to see Christmas anything for awhile, but it's always nice to have head start for this Christmas! I kept the card pretty simple keeping my image and coloring in the center and only doing a few colors. 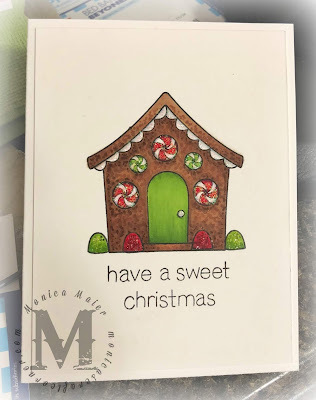 I stamped the gingerbread house, stamped the decorations and then colored everything. I did add some stickles to the candies for some sparkle! Happy New Year, Monica! Awww... that really is a sweet Christmas card.